A friend of ours in Atlanta recently broke her tooth and required a crown. And, of course she does not have dental insurance. That would make it too easy. She is actually brand new in town and did not even have her own dentist. By the time that she found one, she was quoted a price of over $2,500 for the crown. Ouch! Now, I know that not all medical care is created equal. I also know that there are several other factors going into the pricing of care. Did you know that you can upgrade a crown? I guess we all did when we see rappers and other people with gold teeth, etc. We all know that medical care is crazy expensive especially if you do not have insurance, but you do not have to pay an arm and leg. No one should get gouged, and a little knowledge and go a long way in these circumstances. My mother lives not too far from Atlanta in a small retirement town in the mountains of North Georgia. And, she also told me that she was recently quoted $850 for the very same procedure at her rural dentist. So, the moral of the story is that you should shop around for your medical care especially if you do not have insurance or very much medical or dental insurance. It pays to shop around in everything…including medical care. 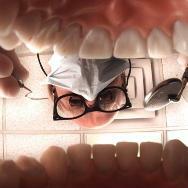 Take a two hour drive to a small town dentist or doctor for a large procedure. Even with crazy gas prices and a gas guzzler, it could be worth it to travel for care. You can also ask for a discount from your current doctor. Treat non-life threatening procedures like buying a car. Make one doctor compete against another one on price and care. Do not be afraid to call a doctor out and tell them that you are going somewhere else that will treat you and your wallet right. Has anyone else had any other experiences with small town medical costs?